Have A Fire Extinguisher: It is even illegal for your vehicle not to have a fire extinguisher. It shows how important it is. 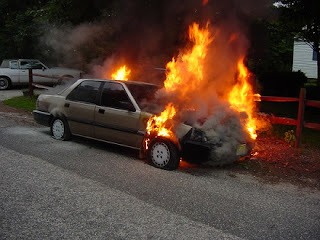 Drive Safely: Most car fire accidents occur after collision when driving recklessly. Ensure you don't drink and drive. Also, be at alert. Don't doze and drive. Avoid Transporting Fuel: Fuels are highly inflammable. As much as possible, try not to transport fuel in your vehicle. If you must, keep it away from electrical wires. Tidy Up: Plastics, bits of paper and other stuff that burn easily should be cleared from your car.